....would you buy their insurance? At our local track the trophy girls used to set in the stands. To get the girls on the track for the pictures I would lift the girls over the rails. I quite that when one night I found out the young lady (?) was wearing only the dress! Oops. Jerry Lee, I've always enjoyed this thread. Ran across this one recently and just had to post it. Racers and promoters always seem to have fun. This one from Sidney, NE in 1952. Yes! that Manure Spreader is meant to be in the picture. No convertibles that day. The spreader was the 'convertible' to cart out the trophy "girl" for Curly Doggett that Sunday afternoon. 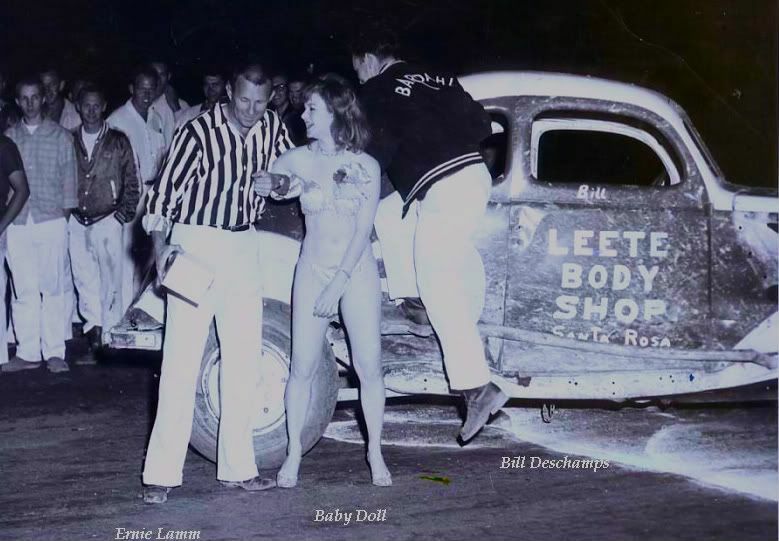 Don't be fooled by the short dress, that's really track announcer Bill Ward getting into the act, lipstick and all. He was a character, always kept the crowd going. Just another fun day at the races. Hey Bill, you get 1st prize for the funniest post in this thread. I wonder if there is a close-up pic of the "Trophy Girls" legs. Looks like the right transport for this event. So happy to see this thread re-ignited.Went back and checked every page just to make sure! 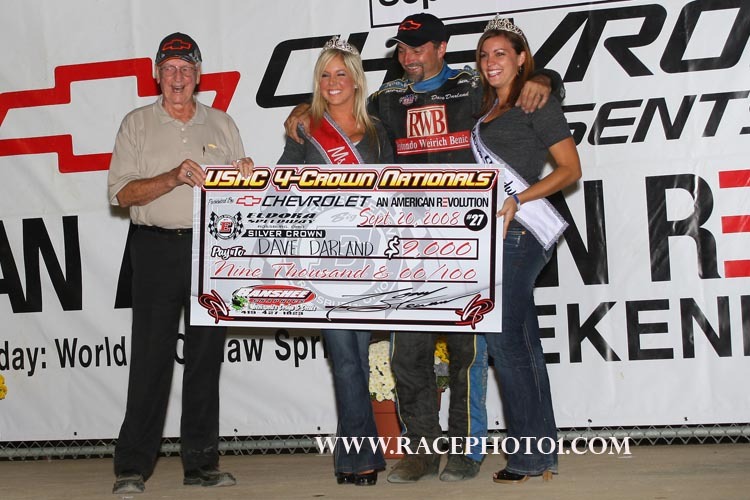 Dave Darland at 2008 Eldora 4 Crown. It ain't the trophy he's looking at. Hey, you pick YOUR trophy, and I'll pick MINE! From a 1967 Cavalcade of Auto Racing magazine. Thanks to Rex Skaggs for the use of this picture.